Gianaclis Caldwell's recent book, The Farmstead Creamery Advisor, is a guide to starting and maintaining a cheesemaking business. It's the missing manual that every aspiring cheesemaker has been looking for....a guide that literally walks you through the process of starting from square one. But it's not only a how-to guide: one of the things I like most about this book is that she's up front about the many challenges inherent in the startup process. Her "10 questions for Aspiring Cheesemakers" gives you some idea of her humorous but very realistic take on the artisan cheesemaking business. Because a spoonful of sugar helps the medicine go down, right?! Gianaclis took some time out of her busy schedule at Pholia Farm in Southern Oregon to answer a few questions about her book and about the business of making cheese. You've got plenty going on between taking care of your goats and making cheese. What made you want to write a book about it? Well, I think one of the traits that makes for a successful farmer of any type is a certain amount of masochism...and I mean that in the most wholesome sense! But seriously, you have to be drawn to a high level of pressure, both mental and physical, to go into this type of work. And for me there is also a desire to have a new project, a new area to explore, and a new frontier to pursue. It was so difficult for us to find resources that would help us design and build our dairy and creamery and then after it was done we were constantly answering questions from others who were interested in doing the same thing. I had always wanted to write, and the idea of writing something practical that would help others was very appealing. Since it also ties into our business, it was easier to rationalize the time (and get support from the rest of the family!) than it would have been had I wanted to write something else - like fiction. So many people are interested in making cheese for profit these days. Why do you think this is the case? What's the attraction? I think a combination of factors (or maybe planets!) have aligned at this time in our culinary history that make cheesemaking so appealing. First the desire to reconnect with food - its production, its cultural history and its quality - and the renewed interest in self sufficiency have drawn people back to the animals, the land, and cottage industry. It is truly wonderful to be a part of this revolution! What resources were available to help you out when you were starting out? Did you have to learn by doing or were there places to go/look for help? There were not many resources - at least consolidated ones that didn't involve some other cheesemaker taking time out of their busy lives to give us advice. Luckily a few did allow us to visit and learn. But we still made a lot of mistakes and have had to learn the hard way - hopefully that is mostly over! Now that Pholia Farm is an established creamery, what are your biggest challenges going forward? One of the challenges that I would not have foreseen is holding up physically to the job. It is demanding and for some reason, every year we keep getting a bit less capable in that regard! Plus you start realizing that you can't push yourself to the physical limit as often and recover as quickly. So I guess the plan would be to have some help eventually, but being people who would rather do it all ourselves, that will be a personal/mental challenge to overcome. Do you think the local/artisan cheese movement has peaked (either locally or nationally) or is the growth sustainable long term? It sure doesn't seem to be anywhere close to peaking. What seems to be happening, in addition to the constant inflow of new cheesemakers, is the continued improvement of quality in the cheeses produced by existing and new cheesemakers. I think the pressure from new cheesemakers is helping to inspire this. What SHOULD happen, is a absorption of the movement into our culture - so instead of it being seen as a movement or trend- I think that artisanal cheesemaking will become a cultural mainstay - wouldn't that be nice? If there was one message you could give to aspiring cheesemakers wanting to start a farm-based cheese business, what would it be? The one thing I would like them to be able to do is to see beyond the romantic, idealistic vision and understand the reality a bit better before committing their future (and their funds) to the choice. here's a cheese book that's also great summer reading material... There's lots of cheese books out there these days. You know which ones I mean - the exhaustive guides to this, that and the cheeses of the world. Like me, you may even have a few on your shelf. But when do we read these books? Don't get me wrong, I love these books for what they are (especially the one I wrote, of course). But I'm excited to see the 'cheese' genre expanding in new ways... and toward that end, we now have the adventurous new Immortal Milk: Adventures in Cheese by Eric LeMay. At its essence, the book chronicles LeMay and girlfriend/sidekick "Chuck" and their growing fascination with cheese, an obsession that leads the pair to try out a local cheese shop Formaggio Kitchen in Cambridge, Mass.. From there they are taken in, and their world expands: soon enough they're gallivanting to Twig Farm in Vermont, later traveling to the Comte caves in France and then climbing Mont d'Or (of course, after having eaten Vacherin Mont d'Or). On the surface, Eric and Chuck are thrilled by cheese, plain and simple. What's riveting about this book is that they take that enthusiasm to the next level by fully living the fantasy - traveling to the source of the cheese itself, be it Vermont or France or Italy to try - no, experience - cheese in its natural element. You've had Roquefort cheese, but have you had it in Roquefort? And what does it mean to do that? LeMay chronicles this whole romp with expertly crafted observations and self deprecating humor. Geeks will appreciate his detours into such issues as the meaning of 'cheesy' (as in campy), or how you can compare the experience of eating cheese to reading a novel by Danielle Steele. And while he insists that he and Chuck are just cheese 'enthusiasts' its clear that by the end of the book, they have transported themselves by sheer force of will into experts. Follow along and you'll laugh, you'll cry and you'll learn a lot about cheese. Find more on the Immortal Milk website here. For many, the world of cheese seems an idealized place where happy dairy animals roam in perpetually verdant pastures and cheese is made, sold and eaten in lovely sunny settings that evoke European villages of yore. Or perhaps those ARE European villages of yore. And the belief seems to be that if you can find a way to get 'in' with that world, well, then you're set for life. Fact is, for the most part the cheese industry is a subculture much like any other. Egos clash, businesses fall over one another to compete in the marketplace, cheesemongers sift their way through the good and bad cheeses of the world and customers berate workers with their infinite misguided notions. This, my friends, is the real world Gordon Edgar lets you in on in his book Cheesemonger: A Life on the Wedge. And I think the cheese industry is the better for his unretouched accounting....because ultimately utopia is more a state of mind than reality. Edgar is not shy about relating how he got into cheese retail - on a bluff - but a cheesemonger's job description, a combination of serious technical knowledge along with people skills seems to suit him well. His self described punk/anarchist background lends a frank, unapologetic tone to this book, which is precisely its appeal - he's all about bringing cheese to the people. Edgar's forthrightness knocks Cheese (with a capital 'C') off of its pastoral pedestal and shows that it's actually something more complex, mysterious and messy - and thus MUCH more compelling than you may have ever thought. Gordon Edgar will be signing books at the Oregon Cheese Festival in Central Point, OR on March 20th and appearing at Reading Frenzy in Portland on Sunday March 21st at 7pm (free beer!). Also look for him at the Seattle Cheese Festival May 15-16th. Many cheese books serve primarily as guides, intended as gateways to understanding the wide world of cheese. Meticulously organized and carefully researched, they are important reference works. Goat Song: A Seasonal Life, A Short History of Herding, and the Art of Making Cheese takes the cheese genre, such as it is, in an entirely different direction. While the book is in part about starting a small micro-dairy, it goes well beyond simply reporting the highs and lows of the farm experience. In the first chapter, Kessler places himself squarely in the tradition of 19th century Transcendentalists like Thoreau, observing that he'd always "admired how [Thoreau] wove literary culture and agriculture into one fabric." In Goat Song , Brad Kessler roots himself in, and draws inspiration from, agrarian and pastoralist literary and philosophical traditions. But you won't necessarily find an overarching philosophy of life here like you might reading books of Transcendentalists past. This book is more a journey, where keeping goats and making cheese become both a literary and spiritual pursuit, sort of a travelogue through time. While it's certainly not your everyday reference guide to cheeses of the world, Kessler's book points up the rich complexity of all things fromage. The popularity of artisan cheese has spawned an ancillary movement: home cheesemaking. At least here in the Pacific Northwest, it seems that everywhere you turn someone is offering a home cheesemaking class (see my events calendar for a complete list of local events). And thus the proliferation of home cheesemaking books in the past several years, including this new one, 200 Easy Homemade Cheese Recipes by Debra Amrein-Boyes. What sets this book apart is that Amrein-Boyes is a professional cheesemaker - she's the genius behind The Farm House Natural Cheeses, one of British Columbia's most oustanding artisan cheesemakers. This is important information to know, because it tells you that the author knows what she's talking about...the recipes are written from a cheesemaker's perspective rather than a chef's or home cook's perspective. Indeed, this fact is evident right away, because Amrein-Boyes spends the first 40 pages of the book getting readers up to speed with background, a cheese style primer, equipment list and basic cheesemaking techniques. The recipes, all 200 of them, run the gamut from fresh ricotta and mascarpone, to washed-rind Taleggio, to feta, to yogurt, buttermilk and kefir. Mixed in with cheesemaking recipes are accompanying recipes for dishes using the cheeses, like souffles and fondues. The recipes are presented concisely and simply with a minimum of fuss and a maximum of emphasis on technique, temperature and process, all elements crucial to successful cheesemaking. Helpful troubleshooting tips - something I've not seen before in a home cheesemaking book - will aid in the diagnosis of problems as they come up. This is critical because so often home cheesemakers run into troubles, somewhat mysterious in nature, and are left without resources to solve their problems. This is one of the best cheesemaking books I've come across - Amrein-Boyes conveys the complexity and rigor of the practice of cheesemaking, while at the same time making the craft accessible to the masses. Where else to find recipes for cheeses like Ossau-Iraty or Stilton? Sure, some of the cheeses in this book will take time and dedicated practice to make, but as any cheese lover knows, a well made artisan cheese is a beautiful thing in its own right, and well worth the effort. We take milk for granted. Today this ancient food has been reduced to commodity status, packaged in plastic jugs for modern convenience. Somehow it's there, we drink it, and then it's gone. Anne Mendelson's fascinating book Milk, the Surprising Story of Milk Through the Ages unpacks all of the essentially lost history of milk, and in the process reminds us of its cultural significance. There's so much interesting information here it's hard to know where to begin...but I should emphasize that it's not one of those books that is overly academic in tone or loses readers in a whirl of facts and figures. I was completely riveted by Mendelson's revelations - for example, she begins by explaining that in centuries past, goats and sheep were the primary sources for milk as opposed to cows, who were, among other things, less adaptable to hot weather. Also fascinating (and obvious once you think about it) is the fact that until the advent of modern refrigeration, humans primarily experienced milk in sour, curdled or cured form as yogurt, cheese or any of the hundreds of dairy products that have evolved throughout the centuries of human existence. Each revelation is a piece of the puzzle that eventually comes together as the product - fresh milk - that we know today. After reading this book, you'll never look at milk the same way again. Just as Mendelson's book is a cultural history, it is also a culinary exploration - a large portion of the book is devoted to recipes using all manner of dairy products. But the recipes are not presented clinically, they're richly annotated with stories about the food in question. A simple mashed potato recipe, for example, becomes a way to discuss the importance of buttermilk as a source of protein in Ireland. Seemingly innocuous panna cotta has roots in medieval blancmage, which Mendelson notes is still a staple in Turkey. Somehow milk has escaped the popular scrutiny being directed at produce or meat, in this era where we demand to know where our food comes from and how it is produced. I think it's about time everyone understood milk's complex origins and evolution as a food staple in Western culture. If this is something you are interested in learning more about, Mendelson has just book for you. Cheesemaking veterans Rick and Lora Lea Misterly have been quietly working away at their craft for over twenty years on their farm northwest of Spokane. In that time, they've sold thousands of pounds of goat's milk cheeses as Quillisascut Cheese Co. ..... but to focus solely on the cheese would be to miss the bigger picture of the project that is Quillisascut Farm. Over the years the Misterly's place has evolved into a thriving teaching farm, where people from all over the country come to learn all about farming and sustainability. Whether it's simply a school group discovering compost or chefs fully committing themselves to the farm-to-table concept by butchering and cooking a goat, the farm offers myriad opportunities for everyone to, as they say, get their hands dirty. Indeed, dirt is what it's all about at Quillisascut....it's where crops grow, it nurtures the grass that the goats graze on, it's the essence of the farm, of its life. Chefs on the Farm is part cookbook, part seasonal primer and part farm chronicle. It's divided into seasons, following the yearly cycles of planting, tending, harvesting and preserving. The authors, Lora Lea Misterly and Shannon Borg, a Seattle writer, dwell gently in each moment, finding nuance in the daily routines that, taken together, make a farm run and put food on the table. Recipes are presented against the backdrop of their seasonality and as aspects of work and farm life. Does freshen in the spring, then dry off in the fall. Seeds are stored, sorted, then planted in the spring. Animals are butchered, meals are made. Spring comes, then Winter returns. I like a lot of things about this book, not the least of which are the gorgeous photos and Kåren Jurgensen's recipes....I can't wait to make Wild Rose Petal Vinaigrette (spring) or Ricotta Gnocchi with Sibley Squash, Pears and Sage (fall). But I am especially pleased to see food (and cheese) in context, because there is, bottom line, just so much more to making, growing and creating both than most people realize. In a world abuzz with ideas about 'local food' and 'sustainability', Chefs on the Farm breathes life into these sometimes abstract concepts. This book is one more way Rick and Lora Lea Misterly are teaching all of us. Order directly from Quillisascut and the proceeds benefit the Quillisascut Farm School Scholarship Fund. Lately there's been a surge in popularity in some of the more traditional cooking arts like home canning and preserving, scratch baking, even fermenting and distilling. Everywhere you look, people are exploring how to make things from scratch. Kathy Farrell-Kinglsley's The Home Creamery is riding that wave of interest, presenting readers with recipes and advice on some simple projects with dairy products that are easy to make at home. The book is divided into two parts; the first details a number of basic recipes for straightforward projects like cream cheese, creme fraiche and pot cheese. Farrell-Kingsley's explanations of the various process are clear and helpful - important when readers are exploring new and unfamiliar skills. The second half of the book consists of recipes using the dairy products you've created. The recipes, ranging from eggplant parmesan to sour cream raisin pie, are hearty, Midwestern style fare that entice readers to put the products they've made to good use. Any book about making cheese at home must face inevitable comparisons to the gold standard on this topic, Ricki Carroll's Home Cheese Making. 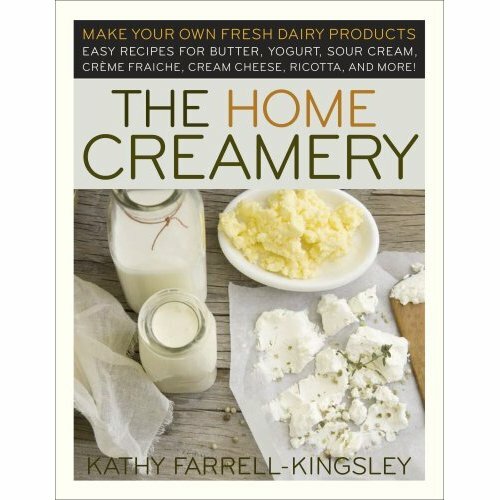 Farrell-Kingsley's The Home Creamery works well as a beginner's guide to the world of creating fresh dairy products at home, focusing on a few uncomplicated recipes that will allow readers to gain confidence in the process of working with milk. However, for those who have already experimented with projects like these and are looking for more complex cheesemaking challenges such as making hard cheeses, Ricki Carroll's Home Cheese Making may be more helpful for them. Either way, The Home Creamery is a useful addition to the growing do-it-yourself cheesemaking genre.